Tom Boonen showed in today’s Tour of Qatar stage one why he is a four-time overall winner and one of the best classics riders. The Belgian of team Etixx-QuickStep helped gap the bunch including Sky’s Bradley Wiggins and, despite a crash, sprinted to second place behind winner José Joaquín Rojas (Movistar). 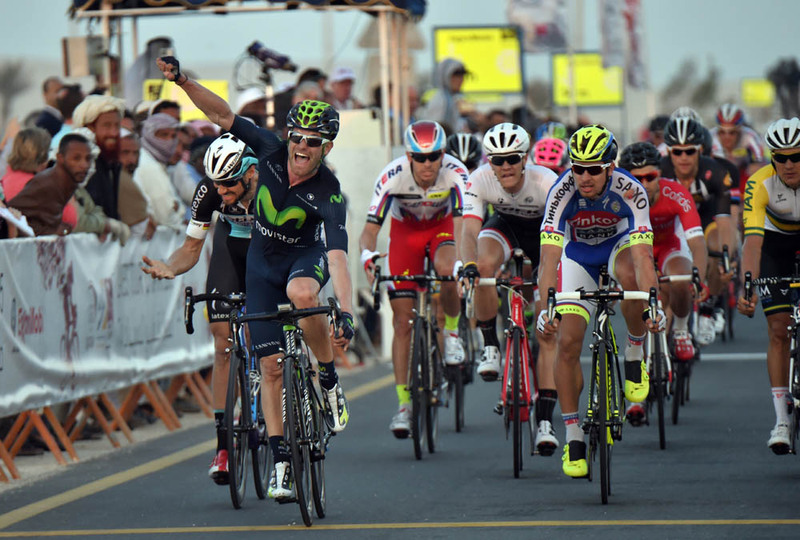 “The final was very chaotic,” Boonen said at the Sealine Beach Resort with the sun setting. Boonen finished second after 3 hours and 49 minutes. His group included around 60 riders like Ian Stannard. Wiggins, sprinter Marcel Kittel (Giant-Alpecin) and many others were gapped at 33 seconds. The split came around 10 kilometres from the finish, but Boonen and his team-mates had also tried mid-race. They split the bunch into several small groups along the windy and deserted countryside, catching Wiggins and others out, but saw it come back together. “It’s what I feared. The active riders would not benefit a lot today because of the headwinds. First I tried, then the team tried, but there was nothing we could do,” Boonen explained. Boonen crashed with Peter Sagan (Tinkoff-Saxo), but said, “I’m fine, I only have this [cut on my hand].” What he showed, however, is that he is fit to win a fifth Tour of Qatar title and ready for the upcoming classics season. He sits second overall at four seconds behind Rojas thanks to the six-second bonus at the finish. On stage three, he will have to time trial against Wiggins and others, but earned a good advantage today. “I’m always very happy to come back to Qatar, you don’t find those windy days anywhere else in the world. It’s a hard-man’s race,” Boonen said on Saturday. “You have six bunch sprints, with this race, you have wind and you average 60 kilometres in the first hour sometimes. It’s not that way in the other parts of the world, so it’s logical that when you are good here, you will be in front and fight for victory in the classics. Almost all the years I won Qatar, I won Roubaix.